Casa Grande has been defying gravity and erosion since about 1350 CE. The current canopy has been protecting it since 1932. It replaced one that was built earlier. January 21 – January 26, 2017. When we left The Rubber Tramp Rendezvous we only had one small plan for what was next. It was January 20th and the next day marches were bring held in cities all over the country and world. Since this march was somewhat political and I know you have heard your fair share of politics lately, I’m not going to talk about it, other than to say we drove to Phoenix, spent the night in a Flying J Truck Stop, drove downtown, marched, learned a few things, and felt glad we could express ourselves in such a positive way with thousands of other people. After the march I checked freecampsites.net and found a place to camp south of Phoenix in the Sonoran Desert National Monument. At the campsite I squeezed out a weak, but adequate Internet signal from our data plan, which I used to do some research on our next adventure. 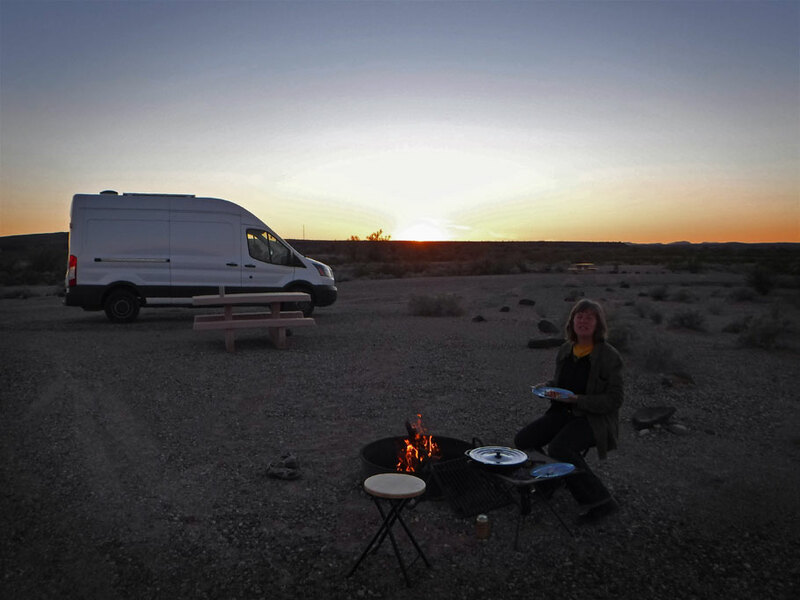 I found a National Park, Casa Grande National Monument, not too far from where we were boondocking, so we made a plan to check it out after a day of rest and catching up on the blog. Ready for the march in Phoenix. 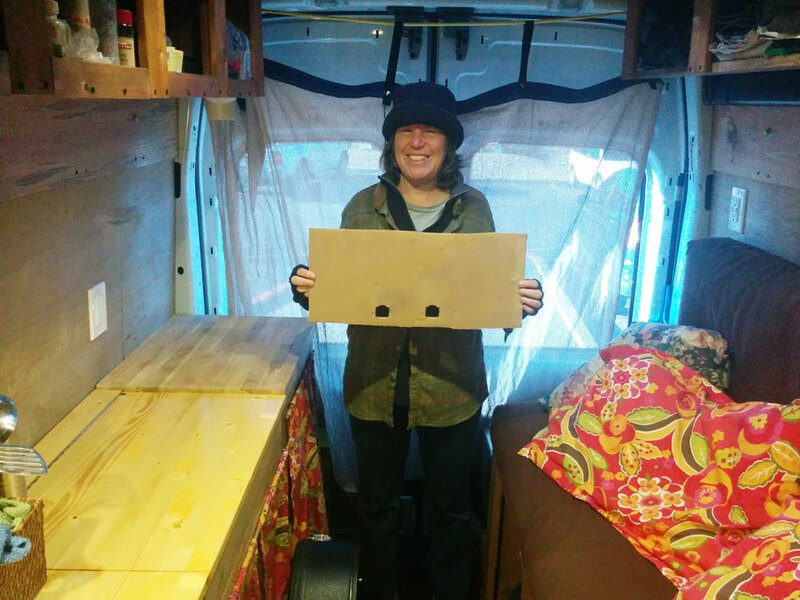 Like I said, I don’t want to introduce politics in to this blog, but I thought I looked so cute in the van I wanted to include it. I blanked out the sign’s slogan – think of your own – what ever is important to you. While we were in Phoenix doing that march thing (which we aren’t talking about), I made a post on Facebook talking about it. A friend commented that she would be in Phoenix the next day and that she’d love to see us. So while we were at Casa Grande I gave her a call. “Where are you,” she asked. “Well,” I said, “right now we’re at Casa Grande.” “Really,” she replied, “Me too!” What an interesting coincidence! 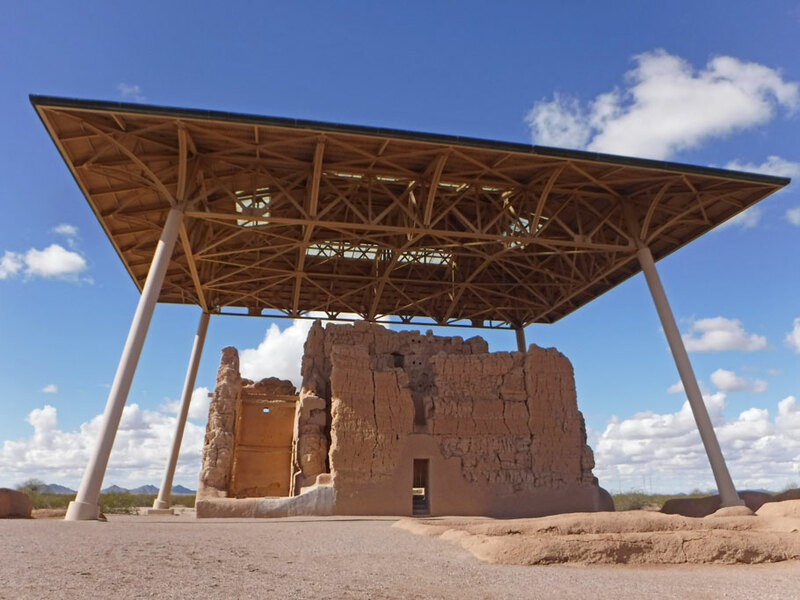 Actually, though, we weren’t at the same Casa Grande – the National Monument and the town of Casa Grande being different places, but they are very close to each other and we would be driving right through the town of Casa Grande on our way back to our campsite. We made plans to meet our friend at Walmart where she was doing some shopping while her mother-in-law was having her hair done. The petroglyphs were to the west. 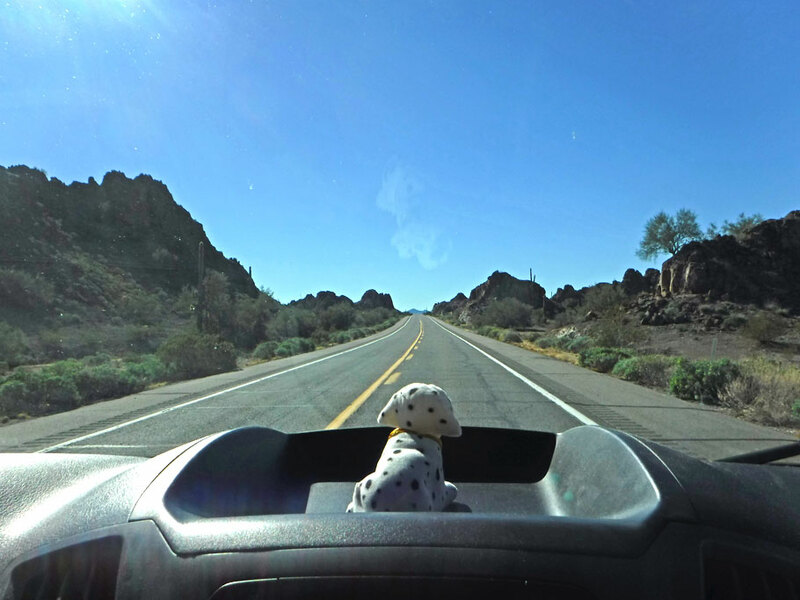 From there we could head straight south to another National Park, Organ Pipe National Monument, explore whatever else was down that way, and then eventually head back east and visit the Kitt Peak Observatory. A plan was starting to come together. 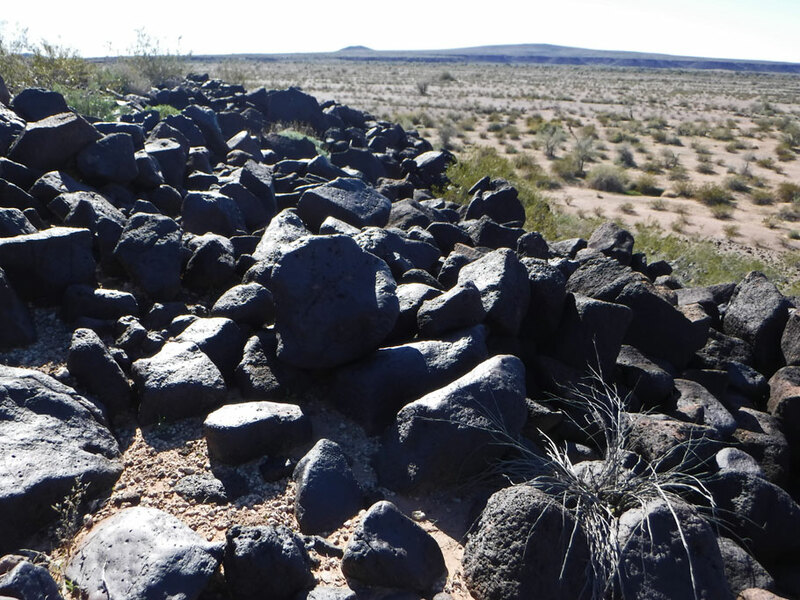 On our way from the petroglyphs to Organ Pipe we drove right through the Barry M. Goldwater Air Force Range. Every once in a while we are so stunned and surprised by so much beauty we just have to stop, get out, look around, and take some more pictures, before we head to the next stop. This journey is based on a loose plan, but sometimes the surprises and people we meet along the way are the best part. 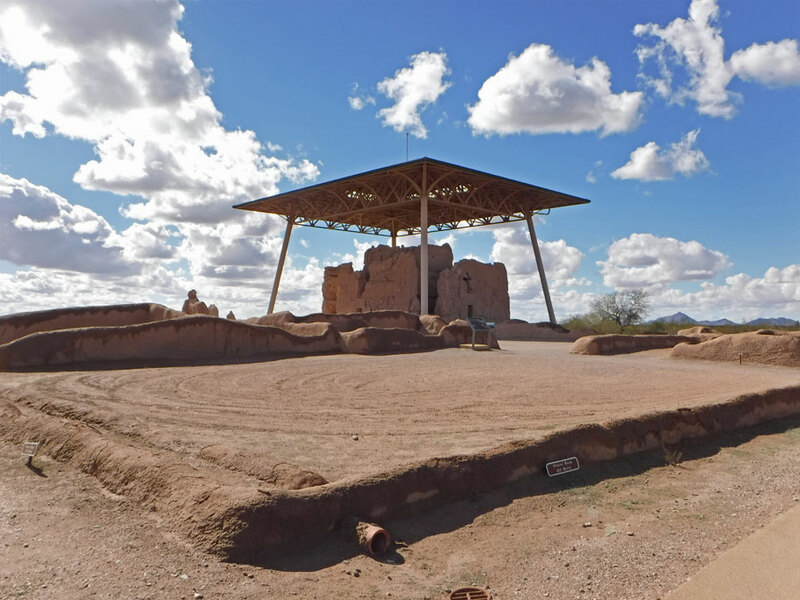 The Casa Grande structure was built of caliche, which is found on the ground underneath. Adding water makes it workable. Starting at one corner, the wall was hand-patted to about head height. By the time workers completed the square base, the starting point was dried like concrete. Atop the dried section they started again, tapering the walls so they are narrower at the top. Spaniards, arriving in 1694 asked the Native Americans they found here who had built it. They mistranslated the answer to Hohokum, whose meaning is really “Those who came before”. The builders were up on their astronomy. The walls face true north, south east and west. Certain windows are aligned to mark solar and lunar events. 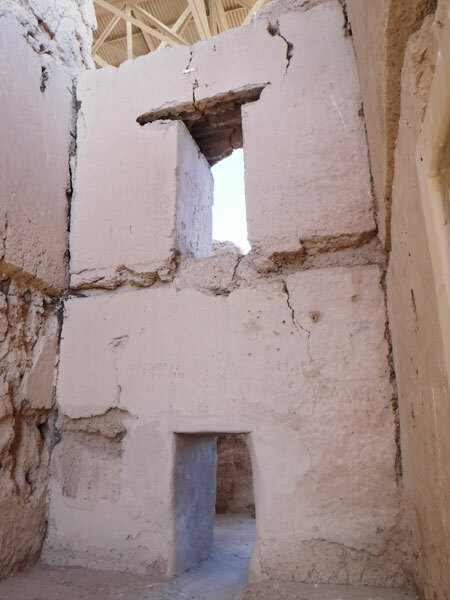 Walls are four feet thick at the base. Wooden lintels support the walls over the doors and windows. Agave – more than just an ingredient for tequila. 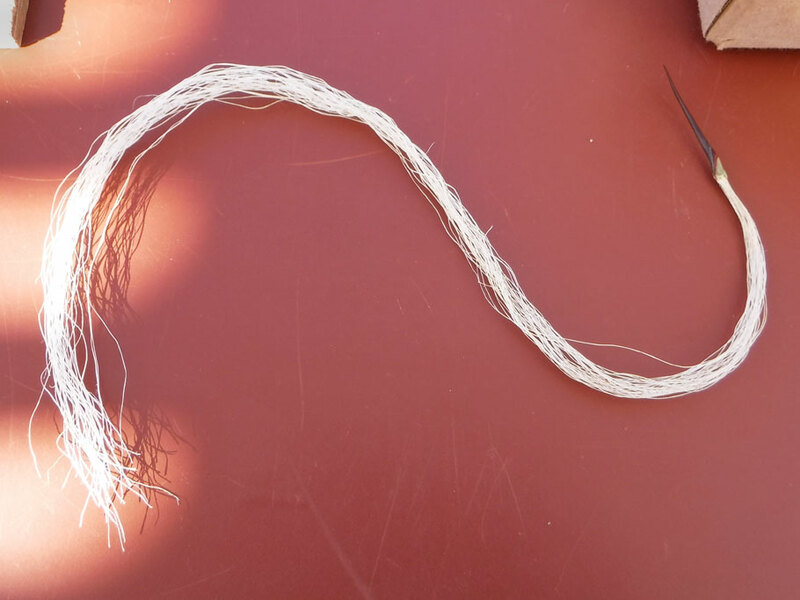 It can be dried out and used for sewing. Needle is already attached. 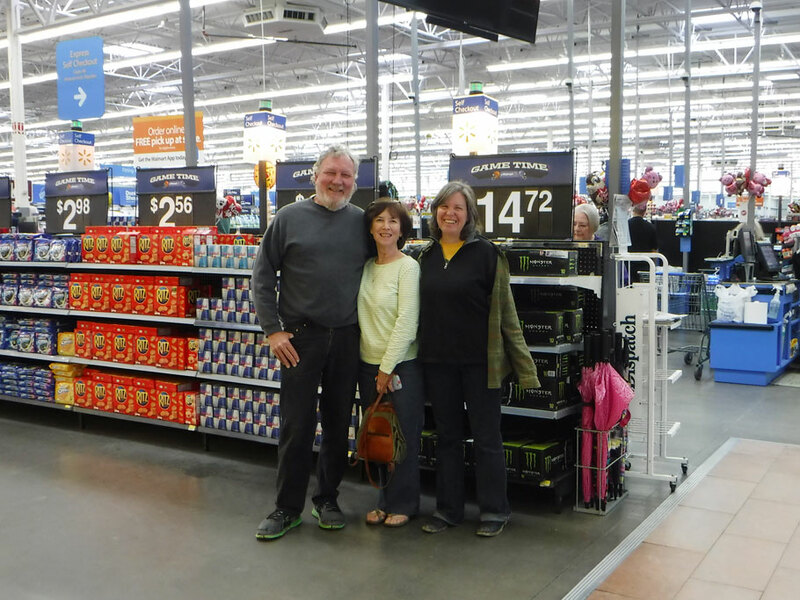 Greenville pals meet at the Casa Grande WalMart. 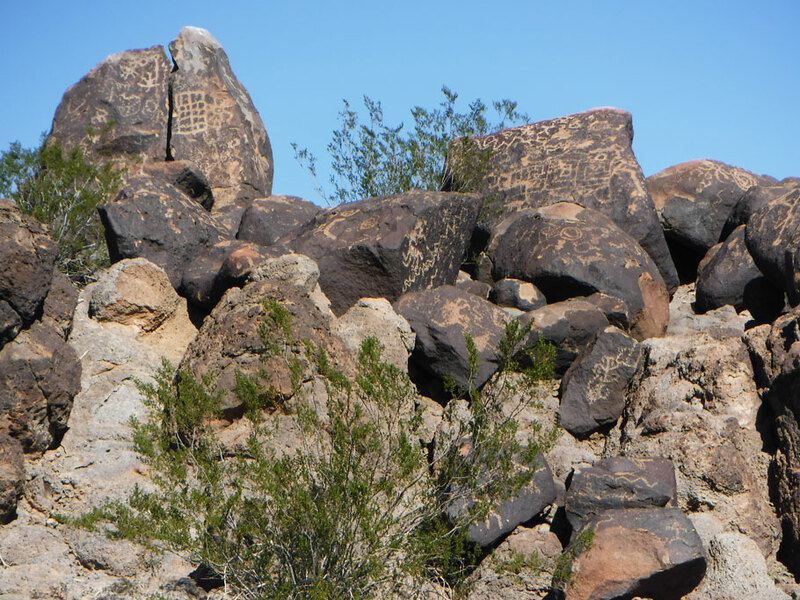 Many of the rocks on this hill are covered with ancient petroglyphs. Were they ads, directions, religious icons, or graffiti? Who knows? Chip away at the stone. Ancient peoples used tools to chip through the dark surface of the rocks, exposing the lighter rock underneath. Animals, people and geometric shapes are depicted. This rock was particularly popular. Atop a nearby hill we found a couple of small petroglyphs. The nearby stones there were almost black from desert varnish. The varnish is created by windblown clay particles and organic material which reacts chemically in the extreme heat to form a dark brown patina. It takes many thousands of years for the surface of light stone to turn this dark. 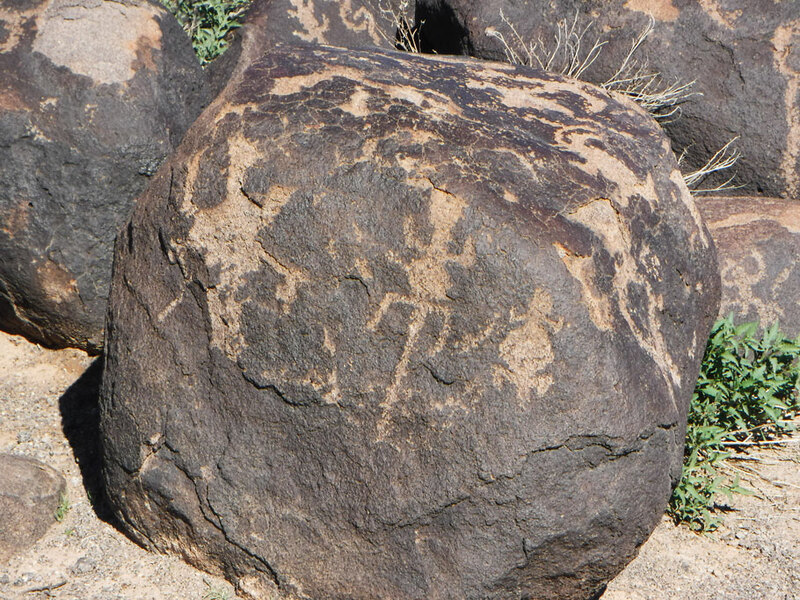 The lighter parts of some petroglyphs have darkened. Those pics are REALLY old. Dinner at Painted Rocks Petroglyph Site. This is the Solar Generating Station south of Painted Rocks. Some 1500 workers were employed to construct it. It employs 85 people now. Using parabolic mirror troughs to heat water for two huge steam generators, it powers 70,000 homes. Here in the Barry Goldwater Bombing Air Force bombing range Bob wants to stop for some pictures. The Sonoran Desert stretches from Arizona to the southern tip of Baja. Saguaro, ocotillo cactus, mesquite, and creosote bushes can be found everywhere. Mountains are on every horizon, but here we have nice rock formations right by the road. 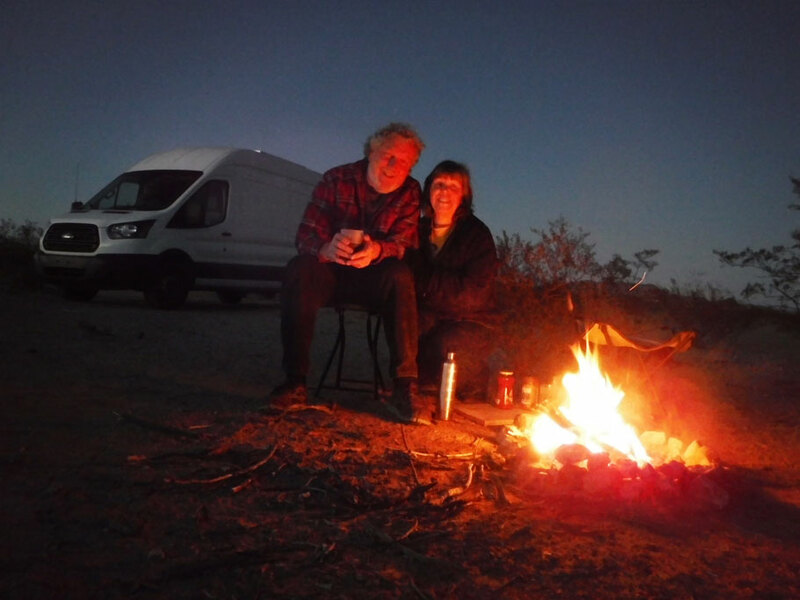 We found out later that we could camp in the bombing range. You just have to watch an instructional video first. Our campsite near Organ Pipe National Monument. Ready for our next adventure in (and blog about) Organ Pipe National Monument. 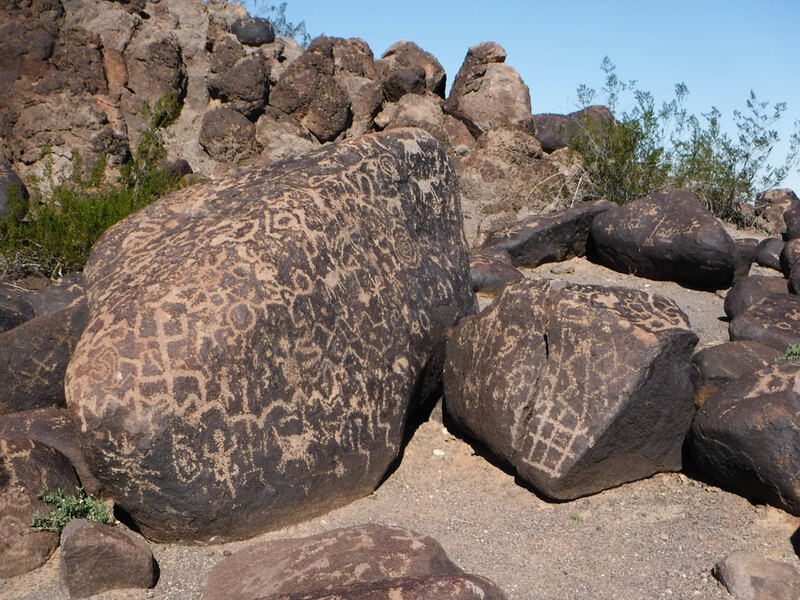 This entry was posted in Arizona, National Park Service, Travel On The Dirt and tagged Arizona, Casa Grande, Desert Varnish, friends, National Monument, NPS, Petroglyphs, Rocks. Bookmark the permalink. You guys are living a great adventure, I’m happy for you! Keep sending the great pics. Thanks! We have tons of pics. Our trip is over in three weeks, but we will probably be posting blogs for months.